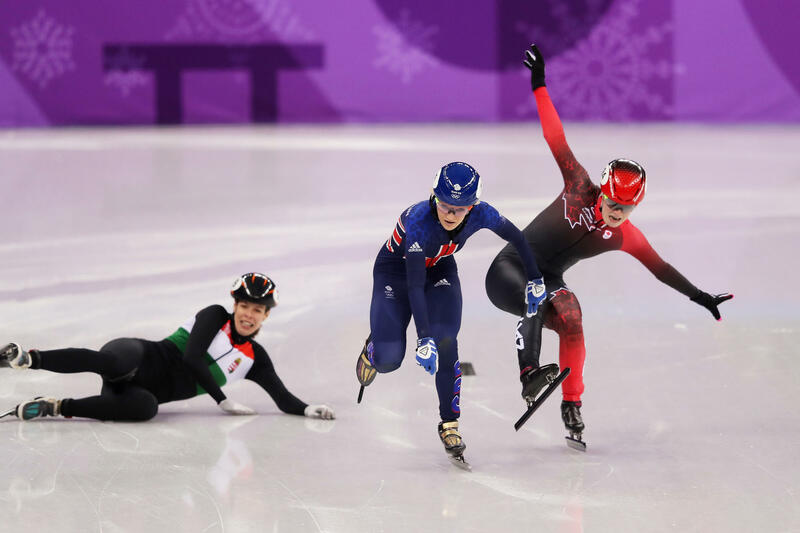 Speedskaters Elise Christie of Great Britain gets by Kim Boutin of Canada and Andrea Keszler of Hungary as they fall during the Ladies' 500m quarterfinal on Feb. 13. "If the pass is gonna be close or tight," says U.S. speedskater J.R. Celski, "we usually say 'bombs,' like 'Uh-oh, something's gonna blow up!' So it's like an explosion. It most likely means people are falling." 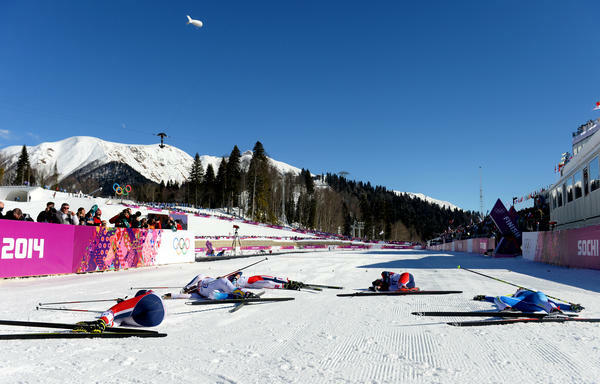 Cross country skiers lie next to the finish line after competing in skiathlon at the Sochi 2014 Winter Olympics. "If you 'bonk,'" says gold medalist Jessie Diggins, "it means you've just run out of energy, there's nothing left in the tank, and suddenly your body can't go on anymore." He explained it this way: "You're on a downhill, you fall, your skis and poles are all headed in different directions." And how would you use it in a sentence? "'I had a serious yard sale on that big downhill over there,'" he offered. "That's never a good time. Except for your teammates and the camera crew." In truth, a lot of the lingo I've picked up has to do with disaster — spicy ways to describe when things go horribly wrong, as they often do in ultra-high speed, high-amplitude sports on ice and snow. Take aerials, where skiers fly 60 feet in the air, flipping and spinning their way back to earth. If you're unlucky, you could end up crash-landing in what's known as a "reverse suitcase." I asked U.S. aerials head coach Todd Ossian for a definition. "The reverse suitcase is twisting past the flip and having too much rotation, so you land on your chest," he explained. "So your head goes one way and your feet come the other." Like a suitcase flapping open too far. And how about the "fly swat"? "It's kinda like catchin' an edge," Ossian said, "and the force makes you go to the ground quick. There's a lot of impact there when you do that — slaps you down. And you don't want that." I figured short track speedskating would be a gold mine of cool lingo. It's notorious for its chaotic collisions and spills, since skaters race in a tight pack and jockey aggressively for position, often crashing violently into the pads as they try to pass. Short track skater J.R. Celski came through. "If the pass is gonna be close or tight," he told me, "we usually say 'bombs,' like 'Uh-oh, something's gonna blow up!' So it's like an explosion. It most likely means people are falling." Maybe you've seen what happens in cross country skiing, when the racers collapse on the snow, totally spent, as soon as they cross the finish line. They routinely work themselves to the point of exhaustion. And of course, there's a word for that, too. "If you 'bonk,'" newly minted U.S. gold medalist Jessie Diggins told me, "it means you've just run out of energy, there's nothing left in the tank, and suddenly your body can't go on anymore 'cause you've run out of blood sugar. So if you hear someone say, 'Oh, I bonked in that race,' it means they just, like, BOOM, hit the wall. They're done." And it's not just athletes coming up with creative turns of phrase. Turns out the guys who make the ice for various sports also have their own lingo. Mark Messer, the ice meister at the Gangneung Oval, the venue for long track speedskating, grinned when he told me his favorite — the nickname for a patch of ice causing problems. "We're gonna go check on 'bubble boy' today," he said, referring to a patch with too much air, creating a bubble. And yes, the term comes from a Seinfeld episode ("probably my favorite ever," Messer said) — the one about the boy who has to live in a sterile, plastic bubble and gets in a fight with George Costanza. The ice crew is filled with "real good Seinfeld fanatics," Messer explained. "So a lot of what we do here always goes back to a Seinfeld episode of some sort." And then there's snowboarders' lingo — a foreign language unto itself. The names of their tricks and grabs is a smorgasbord of wonder: Chicken salad. Stalefish. Tamedog. Bloody Dracula. Freestyle skiers seem to share the same devil-may-care approach as their snowboard brethren (and sisteren). Freestyle skier Aaron Blunck boils his sport's attitude down to four letters: "stee." "Stee is short for 'steez,' like steezy run, like style. It's short for style," he said. "We just say 'stee.'" As in: "'Damn, that was a stee run, he showed style, he showed creativity, he flowed,'" Blunck translated. "That's what it means. Pretty much whatever word you can think of, shortened into the shortest way possible, is what we like to say." And when things go wrong? Any colorful words for a bad crash? "Typically, it's just a swear word," Blunck said with a laugh. "It's just the f-bomb, straight up. All the time." Olympic sports have their own special vernacular, slang terms that NPR's Melissa Block has been collecting throughout the games. MELISSA BLOCK, BYLINE: Seems a lot of the lingo has to do with disaster, which strikes often in these high-speed, high-amplitude sports. Take aerials, where skiers fly 60 feet in the air, flipping and spinning their way back to earth. If they're unlucky, they might crash-land in what's called a reverse suitcase. TODD OSSIAN: (Laughter) The reverse suitcase is twisting past the flip and having too much rotation. So if you land on your chest, then your head goes one way and your feet come the other. BLOCK: Like a suitcase that's opened up too far, as head aerials coach Todd Ossian says. And there are all kinds of disaster possibilities. Say you catch the edge of your ski. It could lead to a fly swat. OSSIAN: Just the force makes you go to the ground quick and there's a lot of impact there when you do that. BLOCK: Just slaps you down. TIM BURKE: If you have a bad crash, a lot of times we call that a yard sale. BURKE: You're on the downhill. You fall. Your skis and poles are all headed in different directions. BLOCK: And how would you use that in a sentence? BURKE: I had a serious yard sale on that big downhill over there. BLOCK: You don't want that. BURKE: No. That's never a good time except for your teammates and the camera crew. BLOCK: Maybe you've seen cross-country ski racers collapse on the snow, totally spent, as soon as they cross the finish line. They routinely work themselves to the point of exhaustion. And there's a word for that. Gold medalist Jessie Diggins told me it's bonk. JESSIE DIGGINS: If you bonk, it means you've just run out of energy. There's nothing left in the tank. And suddenly your body can't go anymore because you run out of blood sugar. So if you hear someone say, oh, I bonked in that race, it means they just, like, boom, hit the wall. They're done. BLOCK: I ran into the Japanese women's hockey team and picked up a bit of their lingo from Akane Hosoyamada. AKANE HOSOYAMADA: In Japanese, there's one. It's called donche (ph). In Japanese that means don't check. When you collide it's like doh (ph) and it's like donche. Donche. MELISSA BLOCK AND AKANE HOSOYAMADA: Donche (laughter). BLOCK: Freestyle skier Aaron Blunck boils his sport's attitude down to four letters. AARON BLUNCK: Stee (ph) is short for steeze (ph), like steezy (ph) run, like style. It's short for style. We just say stee. BLOCK: How do you spell it? BLUNCK: S-T-E-E. Stee. Pretty much whatever word you can think of shortened into the shortest way possible is what we like to say. BLOCK: And when things go wrong on the course, typically it's just a swear word, Blunk told me, laughing. It's just the F-bomb, straight up, all the time. Melissa Block, NPR News, Pyeongchang. (SOUNDBITE OF ANDREW BIRD SONG, "LOGAN'S LOOP") Transcript provided by NPR, Copyright NPR.